My lovely son Jupiter went out into the front yard last night during a pause in the thunderstorm that was passing over head and came back with this handsome little fellow. 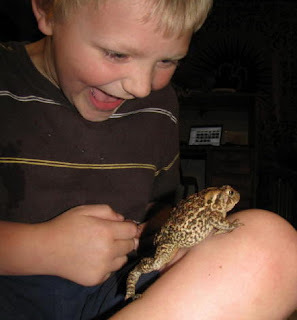 He was calm and cooperative when it was time to send his toad friend back to the front tomato bed. For being non verbal it amazes me how much he understands what we say to him.